Since 2012, the well-rounded A3 has consistently ruled the premium family car class. Rear-wheel drive is a novelty in this class, so the 1 Series is often touted as a sportier choice. The all-new A-Class represents a root and branch upgrade over the previous model. A class. To quote the Oxford English Dictionary, this is “a set or category of things differentiated according to grade or quality”. Alternatively, Mercedes describes A-Class as “youthful and dynamic, but grown-up and comfortable like never before”. That might sound like spin, but it has a point. It’s referring to the new A-Class family hatchback, of course, and boy, has it grown up. Being longer and wider than before, it’s roomier inside, and its swish interior could’ve come from Sir Jonathan Ive’s design studio at Apple. Plus, it’s brimming with new technology, including a clever ‘Hey Mercedes’ voice command assistant. This controls many of the A-Class’s gizmos, so if you’re wedded to Amazon’s Alexa at home, you might think of Hey Mercedes as your bit on the side when you’re out on the road. But we need to grade the new A-Class, for which we need some rivals. The Audi A3 Sportback is the most obvious one; it’s our favourite premium family car, because it’s comfortable and spacious and oozes engineering integrity from every polished pore. But, of course, you can’t talk about Mercedes and Audi without considering BMW too. While the other two follow the convention of front-wheel drive, the 1 Series stands out in the family car class for offering a theoretically sportier rear-wheel drive layout. Each car is represented here in a posh trim level but with a relatively small and efficient diesel engine. 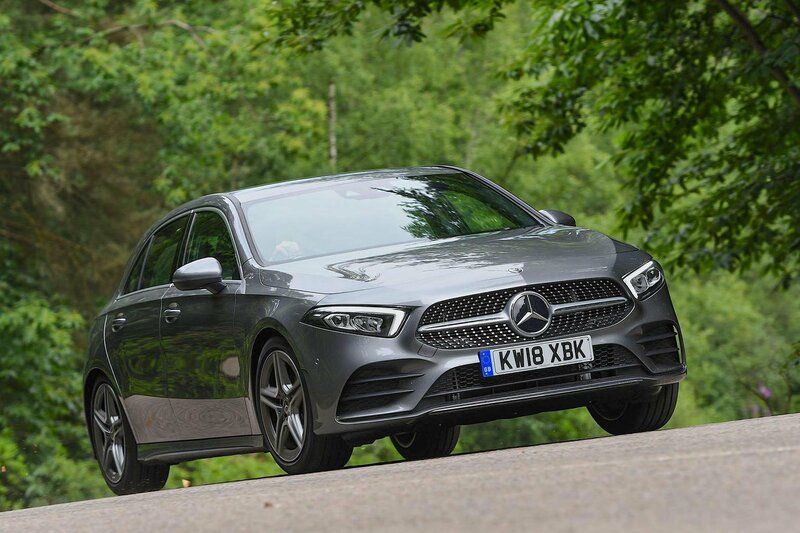 For now, the A-Class comes only with a seven-speed dual-clutch automatic gearbox, while the A3 and 1 Series are fitted with a six-speed manual ’box (although you can have an auto if you’re prepared to pay extra). With the words ‘small and efficient diesel engine’ still fresh in the mind, it’s fair to say none of our trio compels you to don a g-suit before setting off. But thanks to a good old slug of turbo shove from low revs, they’re all gutsy enough for both urban use and on motorway schleps. There isn’t a great deal in it for outright performance, all three covering the 0-60mph sprint in a shade over 10 seconds. However, the 1 Series feels by far the slowest, because its 1.5-litre engine is the least willing to rev. With its best work done by 4000rpm, winding the motor up to its 5600rpm redline feels like torture. By contrast, the A-Class’s 1.5-litre engine is way peppier. Perhaps that’s partly down to its extra (seventh) gear, but from a 30mph rolling start up to the motorway limit, it pips even the A3. We say ‘even the A3’ because in all other respects, the A3’s 1.6-litre engine is marginally gutsier. The A-Class’s automatic ’box chooses its gears wisely and promptly most of the time, but not always. Occasionally it fumbles before kicking down a gear or refuses to change up, even when you’re just tickling the accelerator to hold a steady speed. At least the changes are mostly smooth. 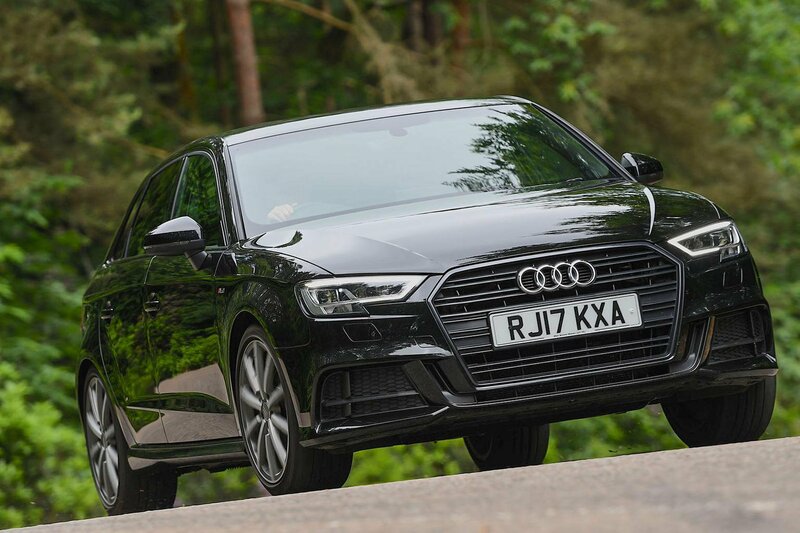 The A3’s manual gearbox is slick and its light clutch pedal, with an easily determinable biting point, makes it a doddle to drive smoothly. Meanwhile, the 1 Series’ springy gearlever and woolly clutch action make it neither pleasurable nor particularly easy to drive in stop-start traffic. Nor is it pleasurable to listen to the 1 Series’ rowdy three-cylinder engine rumbling away at idle. It buzzes in the background like an irate wasp trapped in a bin and transmits the most vibrations through its controls. That said, its rivals’ four-cylinder motors aren’t especially quiet, either; both grumble at idle too. But from low to mid revs, the A-Class’s engine takes on only the lightest tinkle, even if does become a bit coarse when you work it hard. The A3’s motor is marginally smoother as a rule, but it develops a deeper bellow when you accelerate hard. If you spend a lot of time on motorways, the A3 and A-Class offer the most peace and quiet. There’s fractionally less road noise in the A3, but the A-Class is better for wind noise, thanks to its superb aerodynamics. The 1 Series is the loudest at higher speeds, due to a combination of whistling wind and roar from its tyres. None of our trio rides as comfortably as the Volkswagen Golf, but which of them is next best? 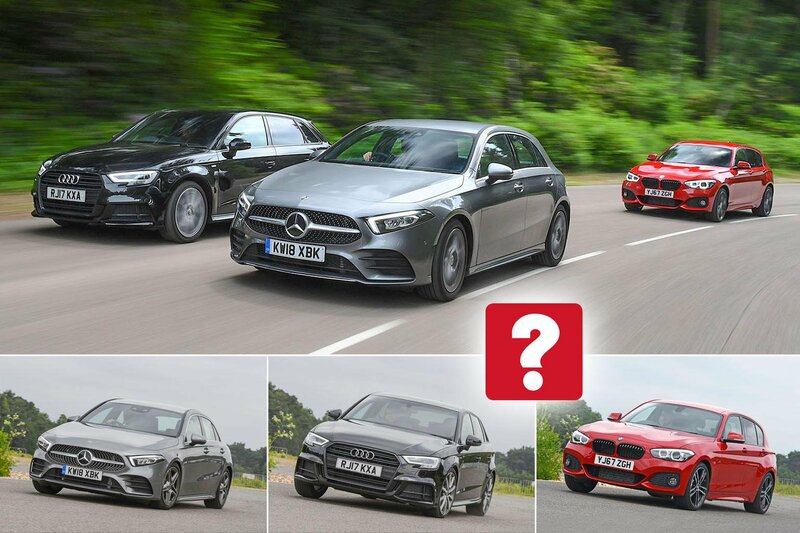 Well, it’s a toss-up between the A-Class and A3. Both are very good, but the A-Class’s softer springs have more give over hefty urban bumps than the slightly firmer A3. Meanwhile, the A3 is marginally more settled on rippled sections of motorway, so it’s horses for courses. That’s assuming you’ve fitted softer Dynamic suspension (a no-cost option) in place of the A3’s firmer standard Sport set-up, though. The 1 Series is the least cosseting. Its standard M Sport suspension is the lumpiest around town, the bounciest over larger crests and the most jittery on poorly surfaced motorways. As with the A3, you can opt for softer suspension for no extra charge, but this doesn’t noticeably improve matters. 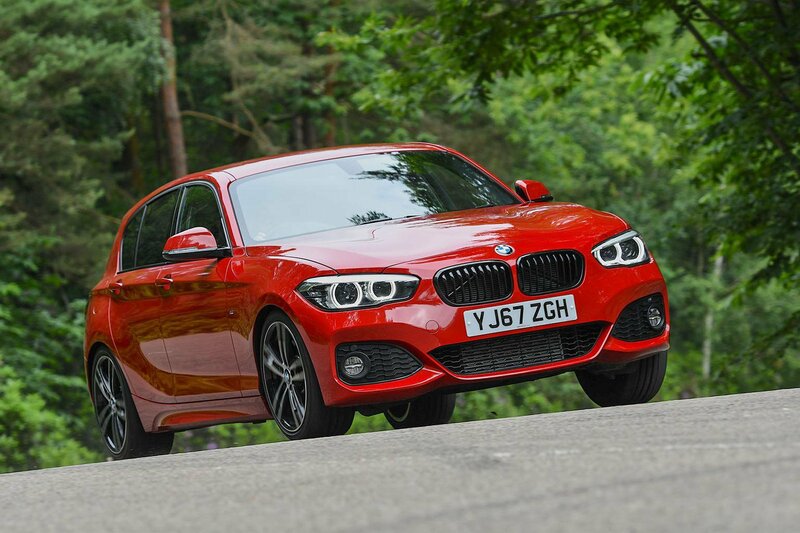 “Ah, but it’s rear-wheel drive, so a bit of the jitters is worth it for sportier handling, right?” Sadly not; the 1 Series simply isn’t as crisp to drive as its rivals. 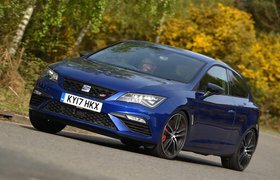 Take its steering: it does the basics of turning the car left and right, but it’s so inconsistently weighted that you find yourself taking two or three stabs at the wheel through a bend that, in the sweeter-steering A3, you can swoop through with one fluid motion. The A-Class’s steering isn’t far off that level, but if we’re being picky, it isn’t quite as linear and predictable. And while they all lean a bit in corners, the 1 Series needs the most time to settle down again, creating a sense of unease if you attempt to hustle it through a series of left-right switchbacks. That’s precisely where the A-Class is at its finest, with progressive body control breeding stability that imparts confidence. In the end, though, it runs out of front grip sooner than the A3, which is the most balanced and enjoyable, but the margins are small.